"The Castaway" is the 68th Mandrake Sunday story. The story was written by Lee Falk and drawn by Phil Davis. Dr. Lake's special fild was epidemics, germs. His studies convinced him that disease germs - somehow - either came or were sent to Earth from Jupiter. One day he recieved a strange package, containing a note engraved on thin metal with blueprints for a rocketship of unknown design. Then, a year ago Dr. Lake was the first man to fly a rocket. But something happend and the rocket vanished leaving no trace. Now as our friends sails slowly on The Ocean Wind they discovered a castaway, who claims that he is Dr. Lake. The Castaway told a strange tale about his experiences on the planet Jupiter. 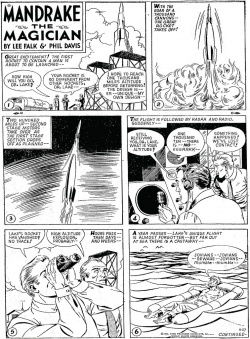 The story title is from the strip of November 20, 1955 (Next Week: "The Castaway").